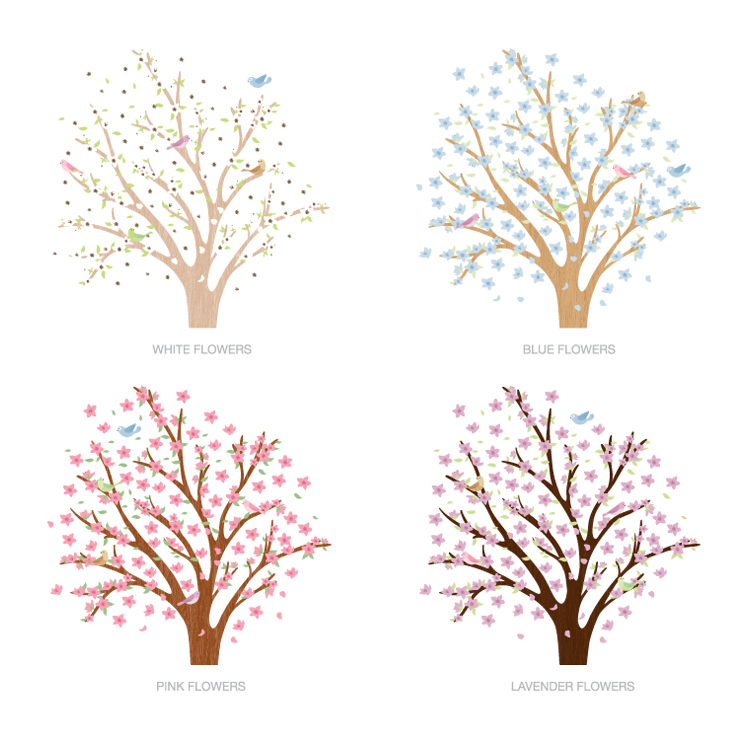 Our Blossoming Spring Tree printed wall decal is perfect for any space! Our Printed Decals are easy to apply and are ideal for any smooth and flat surface! If your walls have any texture, we recommend purchasing a Printed Test Decal Sample Pack first. Full graphic as shown: 82.5 inches wide by 70 inches high. The tree alone: 38.5 inches wide by 70 inches high. Pictured first is our White Flowers color combination and pictured second is our Pink Flowers color combination. Also available in Blue Flowers and Lavender Flowers combination. See third image for colors. Comes laid out in two sections for easy application. The birds will come separate as well as 150+ flowers and leaves so you can create your own look! All of our Printed Decals have a matte finish. Thank you so much! I received the decal I ordered for my daughter today and put it up. It was easy and turned beautifully. I am very happy, and she loved it. Just put my decal up over our bed today. (Two Birdies in a Tree) Love it! Can't wait to put up the ones I got for my daughter's room. Instructions were great - the pictures were absolutely fantastic to have. Came out perfectly, got the hang of it pretty quickly. I'll be doing lots of decorating with these. Thanks! Karen, You are wonderful to work with and I am so appreciative of you taking the time to educate me about the process. It is so nice to have a company that is really willing to work with you to get you exactly what you are looking for! Thank you! I called not too long ago today regarding an order I received having been damaged in transit. I want to thank the customer service person who helped me (I believe it was Emily). She was sincere in her effort to solve the problem with me and I was impressed that as a customer I was not told I'd have to wait, I was not told to make the claim myself and I wasn't hassled at all about it, other than being very bothered by having received it in such condition. Customer service is far more important than a lot of companies pay it mind and can make or break a customer's experience, especially if there is a problem. I will definitely order from Dali Decals again and tell others how great the service is. Thank you again and if you need any further help from me please let me know. The team at Dali Decals provided outstanding customer service from the very first time I called and were helpful every step of the way. We received the monogram decals for our daughter's nursery and couldn't wait to put them up. The directions were helpful and easy to follow. Moreover, the font and size is absolutely perfect and looks so elegant on the wall! It looks as though we had someone professionally hand paint our daughter's first and middle name. Classy and elegant are the two words that come to mind when describing the decals. A big thank you to Dali Decals for your professionalism and kindness each time someone from your team spoke with me. I highly recommend these decals for home and/or business purposes.